SUPER-VILLAIN TEAM-UP #2, Page #30. Original Published Comic Book Art. 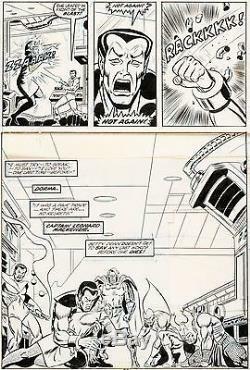 Pencils by SAL BUSCEMA and Inks by FRED KIDA. 10.5" X 16.5" and in very good condition. The item "SAL BUSCEMA Super Villain Team-Up #2 Original Marvel Comic Book Bronze Art 1975" is in sale since Thursday, December 01, 2016. This item is in the category "Collectibles\Comics\Original Comic Art\Interior Pages".